So, you guys seem to have liked my Techniworm Mochamaster tutorial (I won’t lie, that article outperforms every other article on this site by a factor of 10). 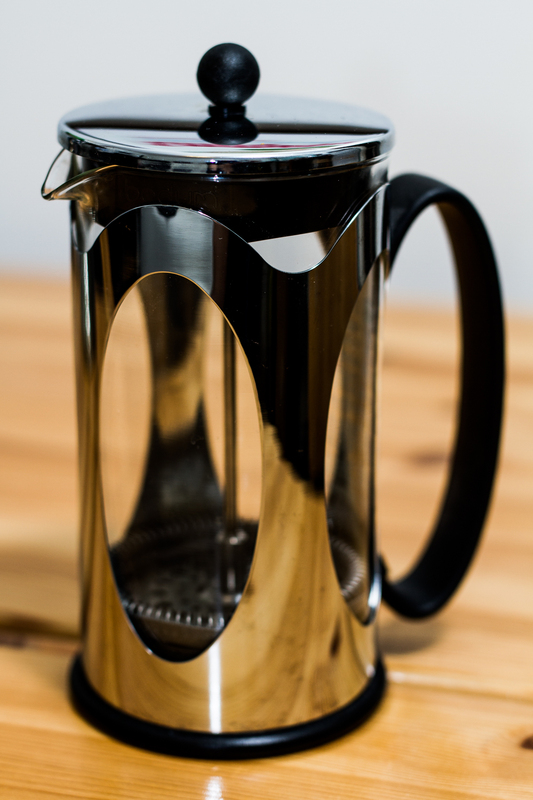 I started thinking about what I could write next, and it occurred to me, the French Press! 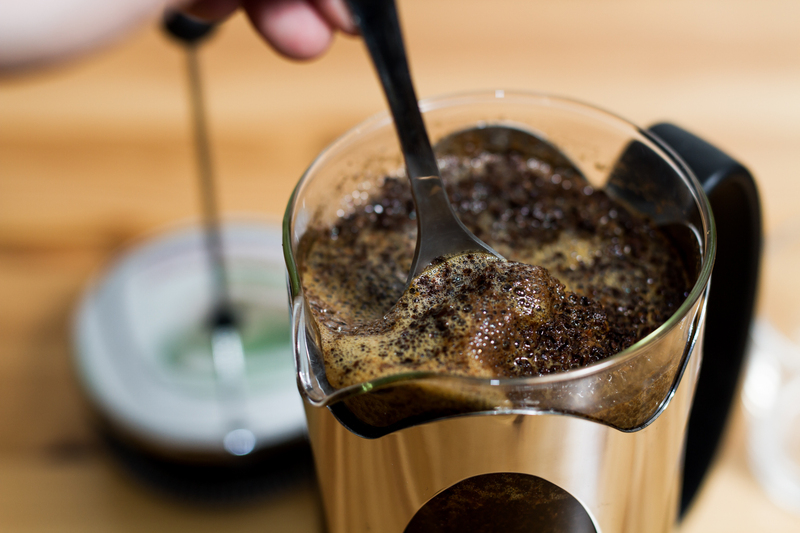 Second only to espresso, French press coffee is among the most horribly mangled and mistreated coffee you come across in cafés worldwide (not counting Greece, what they do with instant coffee there is too horrible to even contemplate). A lot of it stems from the usual suspect, cheap and stale pre-ground coffee, but some places put a lot of effort into their FP (french press) coffee, and it still comes out tasting like industrial sludge. So, since I’ve been studying this brewing method for quite some time, I thought I’d share a bit of technique or two that I’ve picked up over the years that really makes a difference. 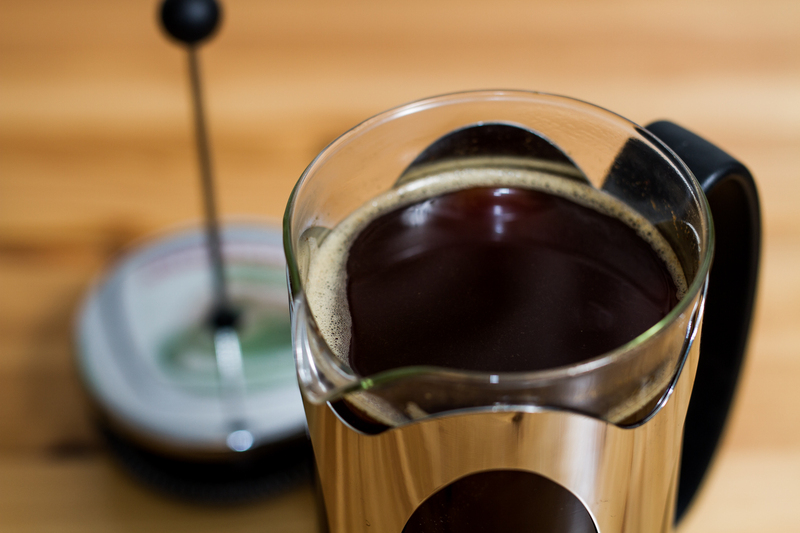 So, what’s the way to go about getting an excellent cup of French press coffee? If you read my Mochamaster guide, the following few paragraphs and their order will be quite familiar. 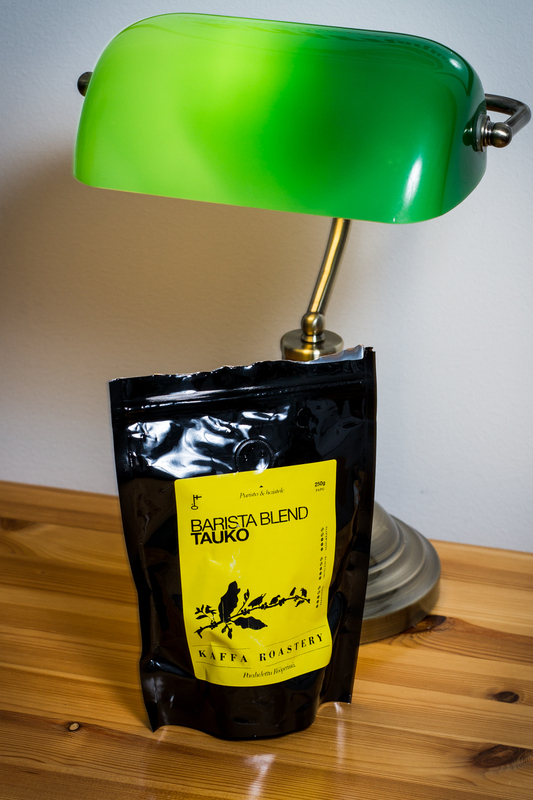 Great coffee starts with great coffee, in this case beans. The coffee needs to be roasted recently, between two days and a month before brewing. Beans fresher than two days are just going to be too full of carbon dioxide to render a good cup, and the whole thing is going to taste a bit raw and acidic. If you go beyond much more than a month after roasting, the beans will have lost most of their carbon dioxide, and the coffee is going to taste a bit flat. The cut-off date is a bit fuzzy, I’ve made good coffee with beans as old as two months, but it’s a bit of a gamble. My suggestion is to start out with really fresh beans, 2 to 4 weeks after roasting, so that you get a feel for fresh coffee. 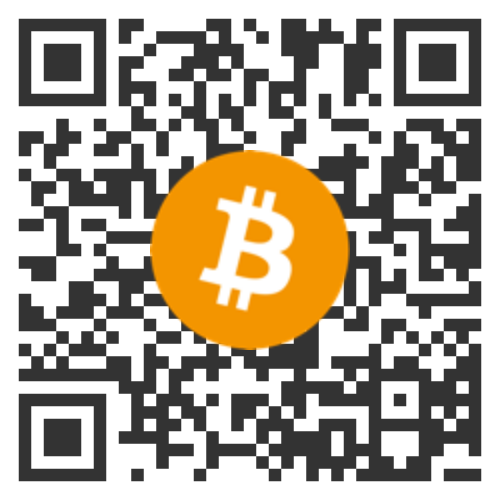 After that you can experiment with going past the 4 week mark and see if you like it. If you can’t find any fresh beans locally, you’re not completely lost yet. Even though I don’t recommend it, you can make do with older coffees, as long as they are not pre-ground. Beans go stale after roasting in 4 to 8 weeks if they are still intact beans, ground coffee goes stale in about 15 minutes. Getting whole beans and grinding them yourself will give you infinitely better coffee than if you went with pre-ground, no matter how old the beans are (as long as they aren’t old enough to have gone rancid, caveat emptor). The grinder is, as usual, very important. Especially for French Press, where you don’t have a paper filter to rely on for catching most of the really fine particles. You really want a burr grinder of some persuasion, the Wilfa in the picture has what’s called conical burrs, where a central auger crushes and feeds beans into the conically mating burrs. 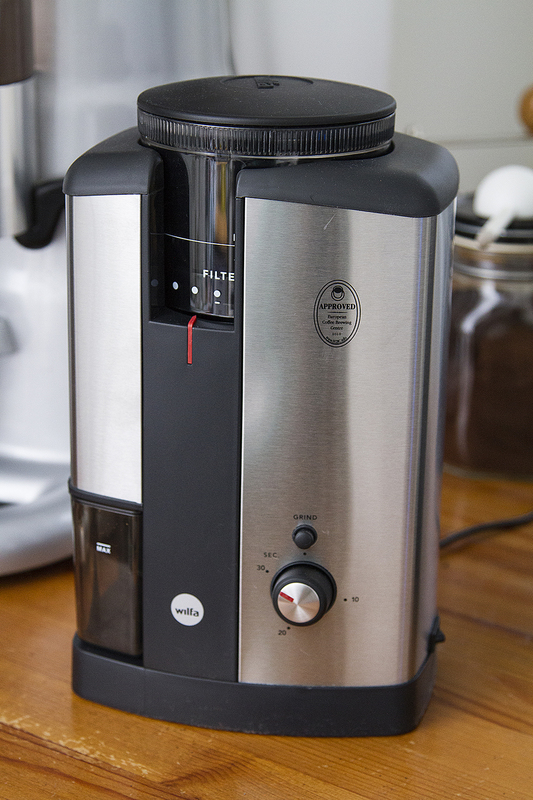 The other kind is the flat burr grinder, which is more common on dedicated espresso grinders. There are some discussions going on about which kind is the best, but you’ll typically see conical burrs on hand grinders and small home grinders, then flat burrs on medium sized (1 to 15 kg per hour approx.) grinders, and then finally conical burrs again on really huge espresso grinders. What you want to stay away from are the so called whirly blade grinders, which are basically a small blender. They produce a lot of fines (which you definitely don’t want in your French press coffee) and they have no control over grind size. With the French press, you have actually two factors that you can control with a set of scales, the amounts of water and coffee. Getting these two right allows you to get reproducible results every time, and here the scales excel. 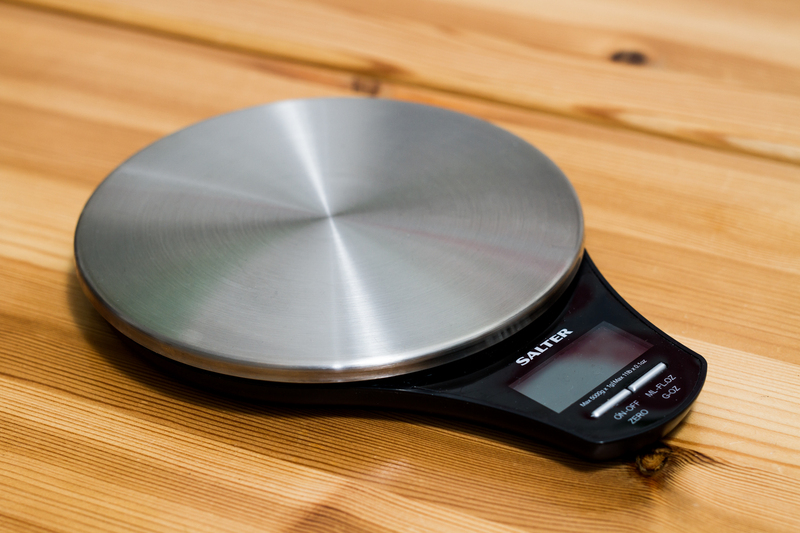 You need something that can weigh out coffee and water exactly down to the gram, and they should be able to handle at least 2 kg. 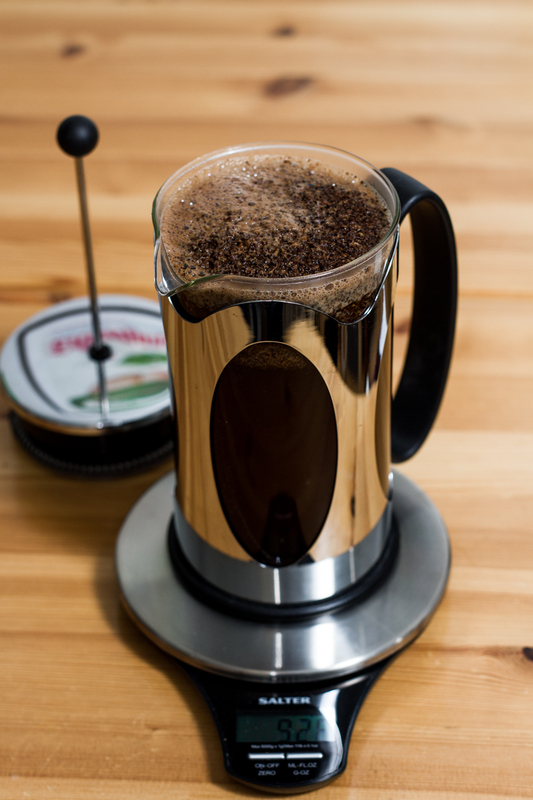 The make and model of you French press is less important than you might think, but you want a pot that’s made out of heat resistant glass so that it doesn’t break due to thermal shock. Here borosilicate glass is really good. You also want something that’s reasonably well made, so that it’ll stand up to years of use. Try to avoid the really cheap models if you can, I’ve had a couple where the plastic holder of the glass pot has broken of after a couple of months of use. Personally, I like the Bodum presses, such as the classic Chambord model, or the more modern Kenya model. 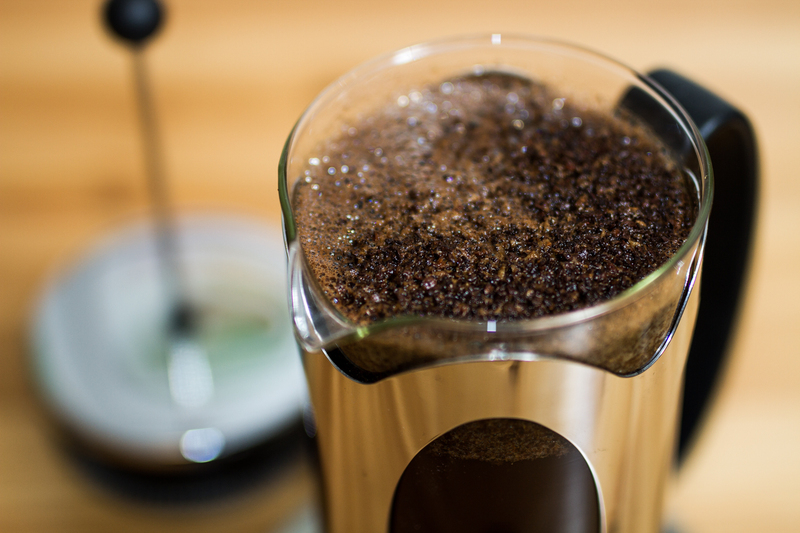 To avoid getting a lot of fines (small dust sized particles that pass through the metal strainer of the pot) in your coffee, you’ll want to grind thicker than for your drip maker. I like to liken the proper grind size to something a smidgeon finer than coarse sea salt. 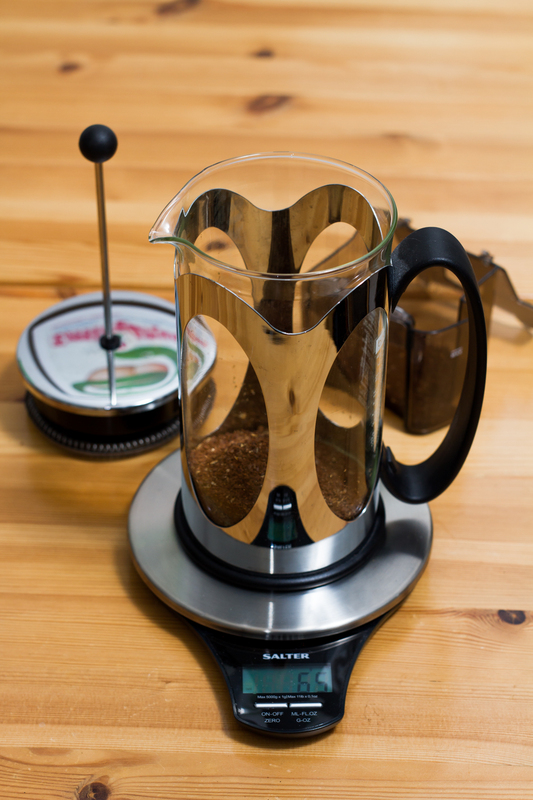 You can experiment with finer and coarser grinds, keeping in mind that finer grinds brew faster, but “coarse sea salt” is a good starting point and should give you good coffee right from the start. 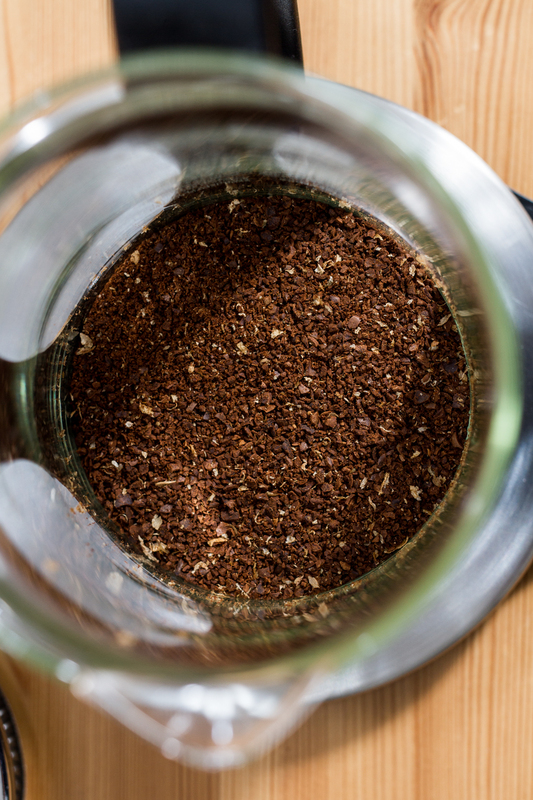 Start by measuring out 65 grams of coffee grinds for 1 litre of water. The rule for good coffee is approximately 60 grams of coffee per litre of water, +/- 10 grams depending on grind size and the particular coffee and how it’s roasted. Zero you scales with the pot and coffee, and pour in water that has just boiled. The time it takes you to move from the stove to the press is enough for the temperature of the water to drop a couple of degrees from 100 °C to a optimal brewing temperature of 92 to 96 °C. 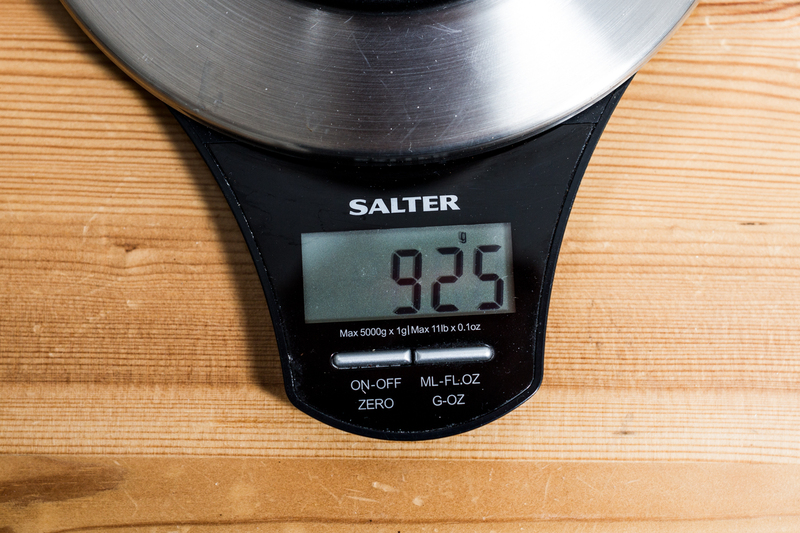 Water has a density of around 1000 g per litre, so for coffee making purposes you can easily count 1 gram as 1 ml. A lot of scales allows you to change the unit from grams to millilitres, but what it does is just that, changing the unit shown. As you can see, my press wasn’t able to hold a full litre with the coffee in it, so I stopped short of a full litre by 75 millilitres. This happens quite regularly for me since the bloom (the head of foam that forms on top of the coffee seen in the picture below due to released carbon dioxide) can vary depending on how fresh your beans are. As long as you’re within 100 ml of your intended volume it won’t affect the end result much, but you can always lower the amount of coffee so that you hit closer to your intended coffee to water ratio in the future. Here you can see the bloom that has formed on top of the coffee. Let it sit and brew for 4 minutes and 30 seconds. 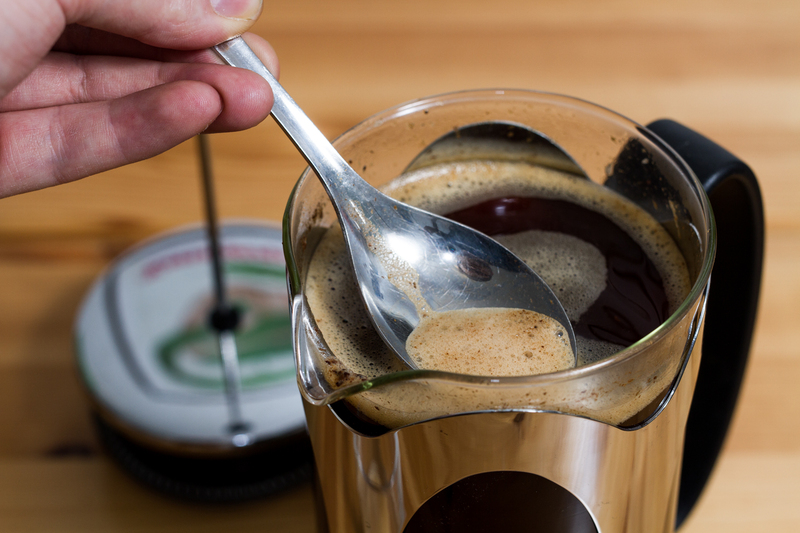 After the brewing is done, we’ll move on to a trick that really makes the difference between good and great French press coffee. After 4 minutes and 30 seconds, take a spoon and press down the coffee grinds that has settled on top and give it a light stir. Next, scoop out all the foam and grinds on the top of the coffee that still remains. The foam on top contains most of the fines in the coffee, and removing them gives you a noticably cleaner cup. If you don’t believe me, try making a pot without this step and see for yourself! After you have removed the foam you’re left with a clean-ish surface. Take the plunger and place it on-top of the coffee. Make sure to orient the holes in the lid away from the pouring spout, and push down the plunger slowly but firmly. You don’t want to go down fast and hard on it, as that will push coffee out of the pot. Orienting the holes in the lid away from the spout also helps prevent coffee shooting out of the spout. What you’re left with is a clean cup of coffee. 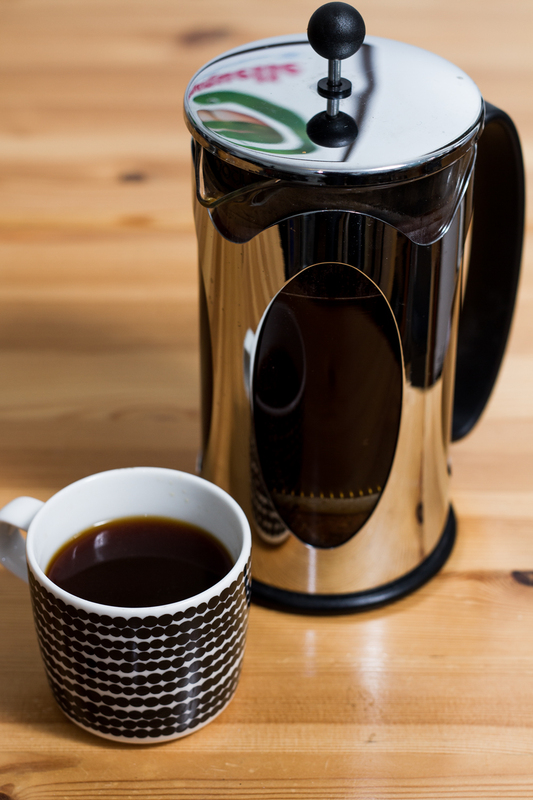 Keep in mind that a French press doesn’t hold heat very well, and that the grinds are still left in the bottom of the pot, slowly brewing away, so if you’re not intent on drinking the whole pot instantly I’d recommend transferring the coffee to a separate thermal carafe. Bodum also makes an vacuum flask press, but they don’t solve the problem with grinds being left in the bottom of the pot, and in my opinion they rob you of the pleasure of watching the coffee being made. They are also almost twice as expensive as the classic Chambord model.